CSU Extension Greenhouse Advisor: Cool off your landscape: Plant something!! Cool off your landscape: Plant something!! It is difficult to think about water conservation and drought when you live in the semi-arid west and during this past June we had more than 5-inches of precipitation, which is more than 3-inches above average. Last June was the sixth wettest June in Fort Collins in the 121 years of recorded weather history. Yet, the hot and dry temperatures will be here soon. 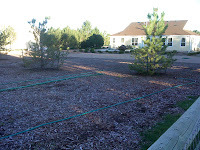 We all have seen those landscapes that attempt to conserve water. You know the one, that one with red rock or mulch with no turf. Or worse yet, artificial turf. Not only do these landscapes look tacky, but what of the energy load on your home? So does the turf or flowering plants in your landscape impact the temperature in your own little microclimate? Well duh, which would you like to walk on, a freshly mown Kentucky bluegrass lawn or the shopping center asphalt? Urban centers always have a higher temperature than rural or suburban areas. This is due to the lack of trees and turf. So want to reduce the temperature and cool down your location? Then plant some plants. 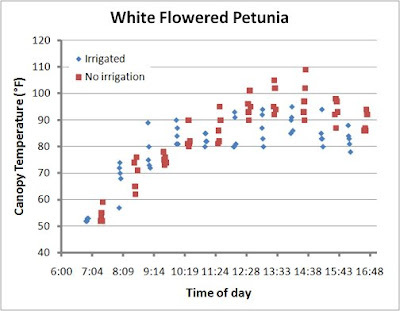 A few years back and after a severe period of drought in Colorado, we conducted some trials on bedding plants and how they responded to decreasing levels of irrigation. What we learned was tha if you establish your plants well, little irrigation is required for a quality display. We also noted that the plants that did well under low irrigation also had lower leaf temperatures. Plants, when well-watered, transpire water in order to deliver nutrients from the soil to the foliage and to keep the plants cool. They are the original evaporative cooling system. As a follow-up to that study, we conducted a trial where we decided to compare plants and plant color to determinine any cooling effects. 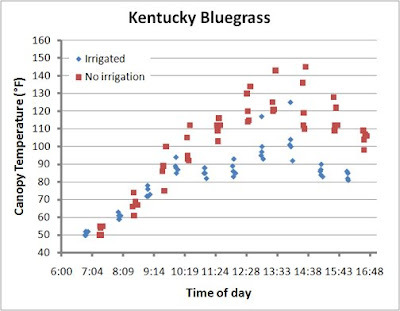 Bluegrass is the coolest when well watered, which will reduce the temperatures of the immediate vicinity. We also decided to look at flower color as well. We compared a dark flowered petunia to a light flowered petunia and we found that lighter colored blooms also help to keep the plant cool as well. This impact is most apparent when the plants are not irrigated.